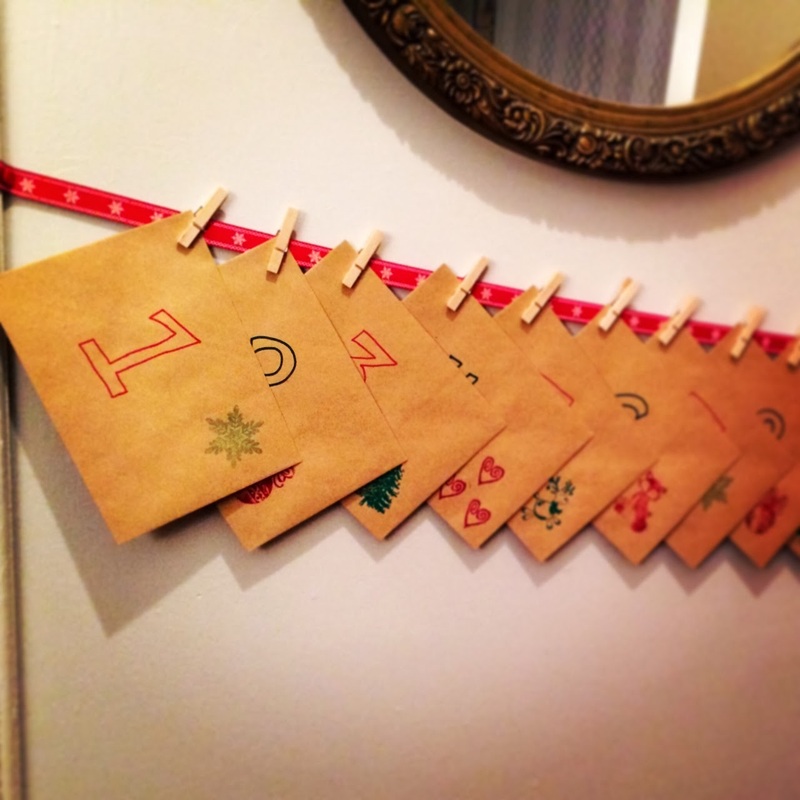 I spent a few minutes being crafty last week, in the name of a meaningful (and sugar-free) advent calendar. I always loved the chocolate advent calendars growing up, and Evy will too in a few years, but this year I wanted to try something different. I printed 25 photos of our loved ones (and realized that I need to take more photos of the grownups in our life). I had some kraft paper envelopes that I numbered and decorated with stamps. Each envelope got a photo, and I pinned them to a ribbon with mini clothes pins. Every day we open an envelope and Evy gets excited to see who’s photo is in there. The photos get pinned to the ribbon, so we’re building a photo display as we go. My plan is to put the photos in an album for her at the end. At this age she loves opening envelopes as much as she enjoys opening presents. The only challenge is that she wants to walk off with the envelopes or photos, or that she’ll occasionally take everything off the ribbon. Not really a big deal, but I’ve had to repin things more than expected. This project was simple, inexpensive, and consistent with the type of holiday season we want to create, with a focus on the people we love. What a great idea Nikki! I did this a few years ago with a template and little doors to open…i love the family focus you guys are instilling in lil evy…very awesome! Such a beautiful idea. And what a wonderful focus for this time of year.